The utility model relates to a sintering furnace, in particular to a special sintering furnace for NdFeB magnets. 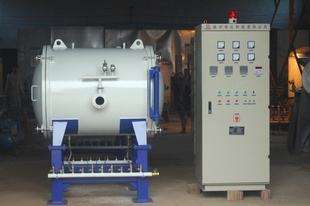 The existing sintering furnace for NdFeB magnet processing mainly comprises a furnace shell and a cylinder body arranged in the furnace shell. A heating element is arranged on the inner wall of the cylinder body in the circumferential direction, and the front furnace Door and rear door. In use, the heating element on the inner wall of the cylinder heats the NdFeB magnet to sinter. Because the two ends of the cylinder body are not provided with the heating element, the temperature in the middle of the cylinder body is high and the temperature at both ends is low, so that it is difficult to ensure that the NdFeB Magnetic performance requirements of the magnet. Rare earth permanent magnet material development process, performance requirements, the main types are introduced, focusing on the introduction of the sintered NdFeB magnet production process, and finally the current sintered NdFeB in the production of scientific research, life and other fields The author summarizes the development trend and points out that it is necessary to study the production process of sintered NdFeB magnets and improve the product quality of NdFeB magnets in order to increase their own competitiveness.